Summer in New York can get surprisingly warm, so the city embraces iced coffee like no other city I’ve ever lived in. The newest craze in iced coffee is nitro iced coffee. This coffee has Nitrogen infused into the coffee to create a similar head and mouthfeel to a stout beer like Guinness. Adding nitrogen gas to make iced coffee frothy is the latest New York coffee trend. 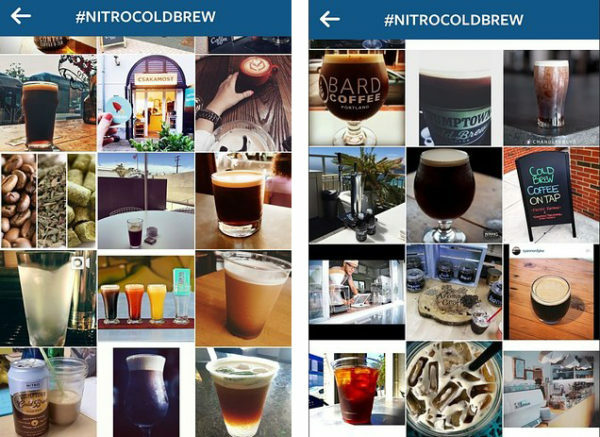 In theory, nitro could be added to any style of iced coffee (espresso made, filtered or even instant), but the trend seems to be to add nitro to cold-brewed coffee. The nitro seems to balance out the sometimes tangy taste of a real cold-brew. The nitrogen swirls around the glass and gradually forms a foam head. 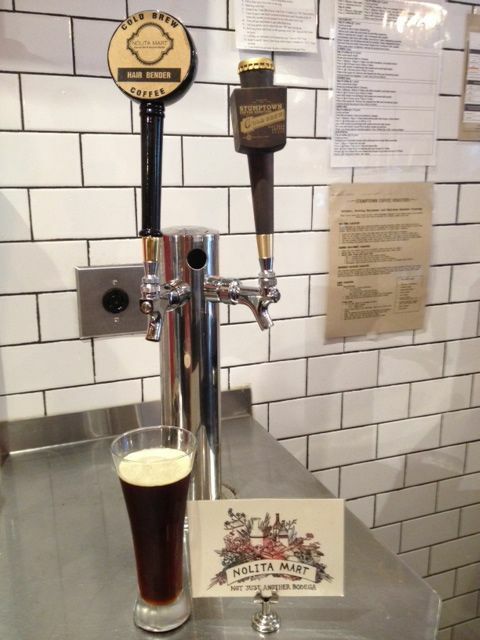 Stumptown coffee roasters are leading the charge and they have nitro on draft at their location in the West Village. They were nice enough to let me try adding milk at the bottom of the pour to make a nitro latte, but honestly, it tastes just as good as plain black coffee without the milk. 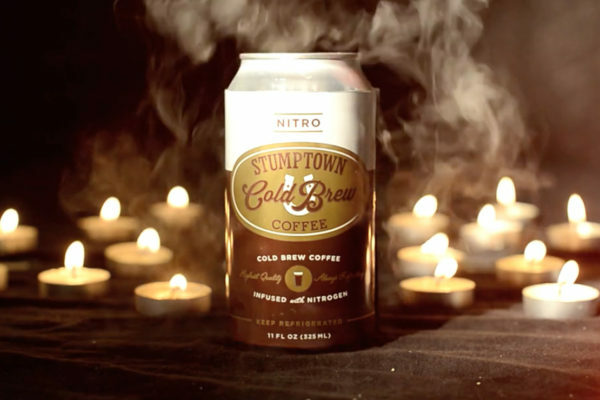 Stumptown have been a leader in adding nitro to cold-brew coffee. Nolita Mart in Little Italy has their own keg system for iced coffee and they are serving Stumptown nitro as well as other iced coffees on tap. 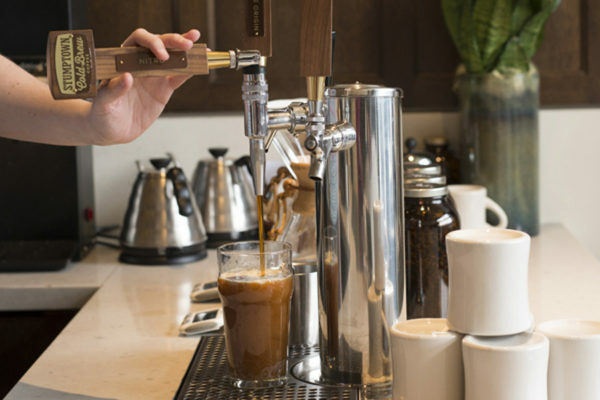 Nolita Mart has their own iced coffee on tap. For a good nitro coffee in Brooklyn, Hungry Ghost is serving the Stumptown nitro on draft. 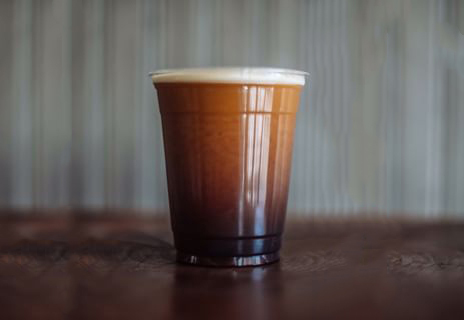 Nitro coffee from Hungry Ghost in Brooklyn. Sahadi’s in Brooklyn Heights has a nitro cold brew from Gillies Coffee Roastery in Brooklyn. But honestly, it was just a bitter coldbrew with some gas infused into it. The Gillies nitro taught me that adding bubbles won’t make up for a bad tasting coffee. So I can’t recommend it. If you’re lucky you can find Nitro Cold Brew in a can, which would allow you to try out this trend at home. Other places the New York Post suggests to check out include Brooklyn Roasting in Flatiron and Plowshares in the Upper West Side. Superb post! You have insightfully described the process of nitro coffee making. Thanks for the share!